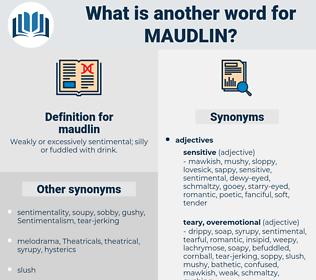 What is another word for maudlin? 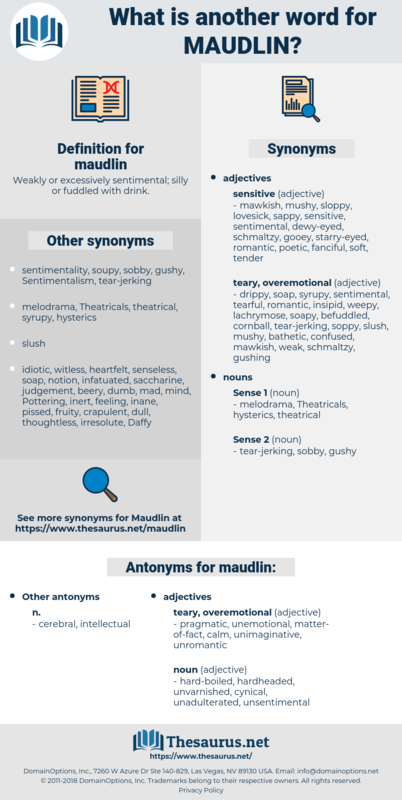 Weakly or excessively sentimental; silly or fuddled with drink. pragmatic, unemotional, matter-of-fact, calm, unimaginative, unromantic. hard-boiled, hardheaded, unvarnished, cynical, unadulterated, unsentimental.
" No, I can't," replied Abel, with a half - humorous maudlin smile. In a maudlin way he stuttered: " L - o - o - k - o - u - t, Lin, she'll k - k - i - c - k you." metal money, mendelian, middle name, medline, mandelamine, modillion, midline, mytilene, medellin, mental home, medallion, methylene, mandolin, middleman.